Get the latest school delays, closure and route adjustments direct via text message. NOTE: "Winter Snow Routes" adjustments apply to both the ride in to school and the ride home from school unless otherwise announced. Occasionally road conditions will improve over the course of the day and when safe to do so drivers will attempt to get the student as close to their regular drop off as possible. Route # 2 - Delete Joppish Rd & River Heights Rd, Alternate Location: Cooks Hill Rd & Lincoln Creek Rd (7:15), Galvin School (7:20), River Heights Rd & Galvin Rd (7:35). Route # 9 - Delete Flumerfelt Rd & O’Connor Rd Alternate Location: Fire Station at Flumerfelt Rd/ O’Connor Rd/Bucoda Hwy (7:10). Delete Zenkner Valley Rd, Alternate Location: Grange at N Pearl St/ Downing Rd & Zenkner Valley Rd (7:20). Delete Blair Rd, Alternate Location: Reynolds & Blair Rd. (7:25). Route # 12 – Delete Loop Rd, Alternate Location: East end of Loop Rd & Little Hanaford Rd (7:10). Delete Halliday Rd beyond Maple Valley Dr. Alternate Location: Maple Valley Dr & Halliday Rd (7:15). Route # 14 - Delete Seminary Hill Rd & Ham Hill Rd. Alternate Locations: Roswell Rd & N. Gold St (7:10), Ham Hill Rd & N. Gold St (7:15) & Seminary Hill Rd & Maple St (7:25). Route # 15 and # 16 - Delete Seminary Hill Rd, Grimes Rd & Ramsaur Rd. Alternate Location: Little Hanaford Rd & Salzer Valley Rd (7:00 – 7:15). Delete Centralia Alpha Rd beyond Nix Rd. Alternate Location: Centralia Alpha Rd & Nix Rd at the trailer court (7:20 – 7:30). Route # 20 - Delete Cooks Hill Rd beyond 2613 Cooks Hill Rd (Apartments), Alternate Location: 2613 Cooks Hill (7:05). Delete Blanchard between Cooks Hill Rd & Graf Rd. Alternate Location: Blanchard Rd & Graf Rd (7:20). Delete S. Scheuber Rd between Military Rd & 1617 S Scheuber Rd. Alternate Location: S. Scheuber Rd & Graf Rd/Military Rd (7:30). Route # 21 - Delete Maple Valley Rd & Winterwood Dr. and Halliday Rd beyond Maple Valley Rd. Alternate Location: Maple Valley Rd & Halliday Rd (7:35). 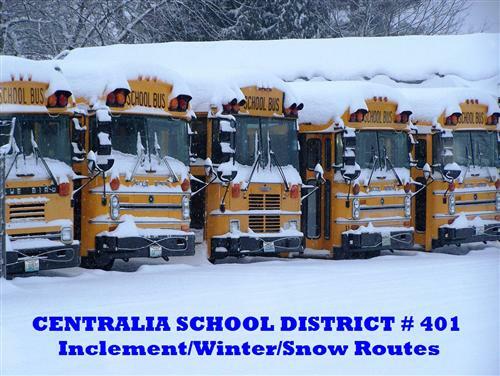 Special Ed Routes # 24, # 25, # 26, # 27, # 28, # 29, # 30, # 31 No Changes unless notified by Transportation Office.